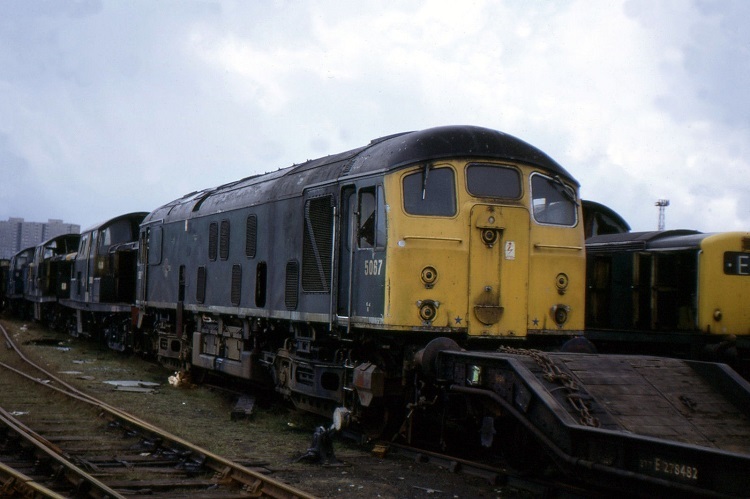 A line of three Class 24s at Stratford depot, all from different builders; D5052 (Crewe), D5067 (Derby) & D5094 (Darlington). The date is probably February/March 1960. D5067 carries the reduced height fuel tank whilst D5094 has the radiator screen frame and the filter frames picked out in white. The twelve year nine month career of 5067 saw allocations to Eastern Region & Scottish Region depots. Tripcock fitted (Eastern Region modification). January 1961 to Stratford (30A). March 1961 to Finsbury Park (34G). September 1966 to Haymarket (64B) on loan, made permanent October 1966. October 9th 1972 - withdrawn. D5067 was withdrawn after sustaining collision damage. It was moved to Glasgow Works during November 1972 and scrapped there by late October 1973. Noted Stratford Works April 1962. Noted Doncaster Works November & December 1963. Noted Doncaster Works December 1964. Noted Derby Works July - September 1966. Noted Glasgow Works May 1969. A typical light duty for D5067 on March 8th was two coaches on the Leighton Buzzard – Luton Bute Street branch, passengers using the service did not reach double figures! D5067 was noted on a passenger (excursion?) working at Brighton early in June, presumably from an Eastern Region London area station. 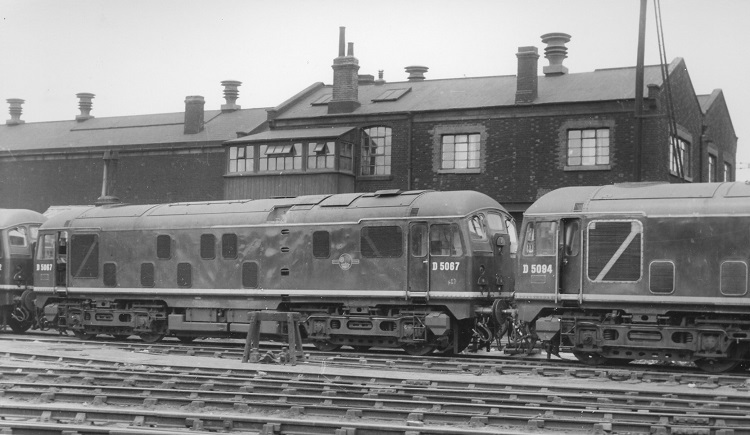 During November 5067 was noted at Eastfield (alongside withdrawn NBL Type 2 D6111). On September 27th 5067 worked a Millerhill - Tyne freight. Surrounded by many Clayton locomotives, withdrawn D5067 at Glasgow Works on April 21st 1973. Also present at Glasgow Works on this day was sister locomotive D5068 in the process of being cut up. Page created January 9th 2016. Last updated March 27th 2019.